As part of my bedroom makeover, I knew I wanted to get rid of our 90’s sleigh bed. I thought about using the barn doors that I salvaged from my in-law’s barn as a headboard. But with the ship lap wall behind the bed the planked barn door felt like it would be a bit redundant. I also considered using a vintage door that I had on hand and placing it sideways on the wall behind the bed. But then I saw this idea of modifying an antique headboard from Rachel at Shades of Blue Interiors. I started looking around on Craigslist for likely candidates and it quickly became apparent that the slanted wall behind my bed definitely limited my options. Just scroll back up and look at that inspiration photo again, it’s tall! And the height is a big part of what makes it fabulous. I found several similar beds on Craigslist, all of which were far too tall to fit under my slanted wall. 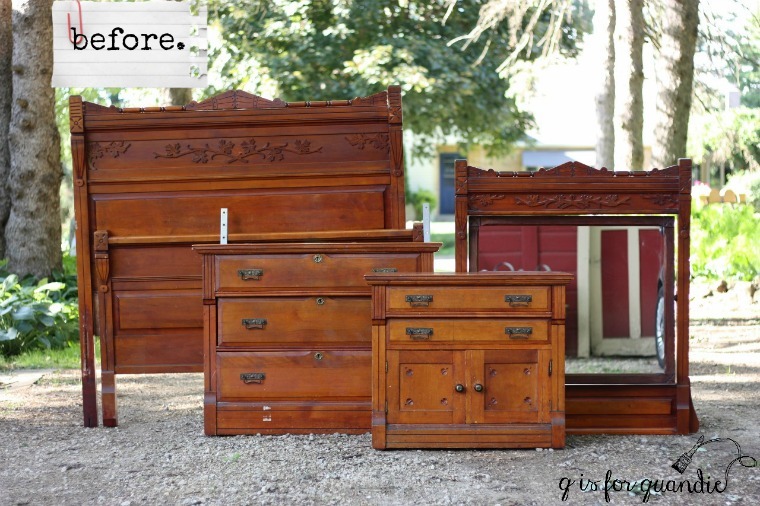 Next I started looking for an antique headboard that either was short enough already, or could be cut down. That’s when I spotted the ad for this bedroom set. The headboard was about 4” too tall, plus the photo with the ad showed the bed with a mattress and box spring in place. I couldn’t see the legs of the headboard to determine if they could be cut down. So I contacted the seller and he happily provided both a photo of the legs and the opinion that I could easily cut 4” off the bottoms of them. As you may know, Queen and King sized beds did not become popular until the 50’s and 60’s. For that reason it’s next to impossible to find antique bed frames in those sizes. 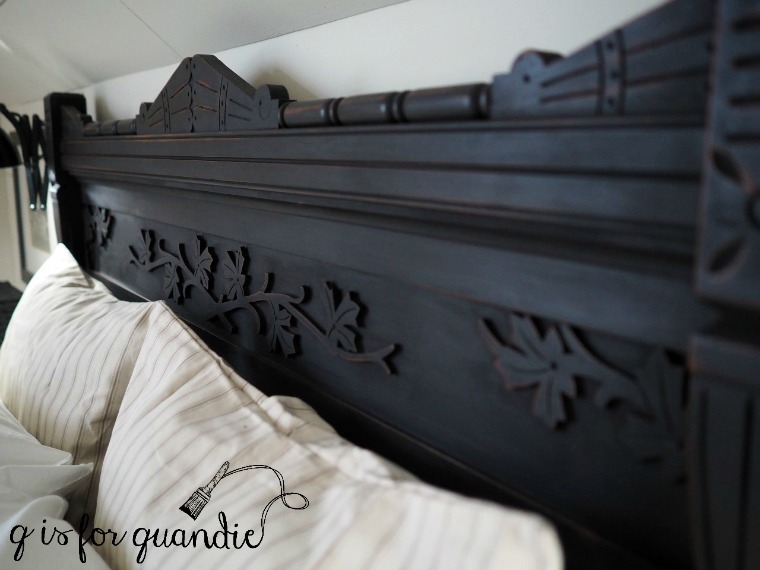 But you can modify a full sized antique headboard to fit a queen sized bed pretty easily and I’m about to show you how. The first step was to send the headboard over to Ken’s workshop. It was a bit wonky and most of the joints were coming unglued. Ken enjoys a project like this. Remember the Humpty Dumpty dresser? He likes to take these pieces apart and then put them back together again with all new glue (he also really enjoys jigsaw puzzles). At one point the headboard was nothing more than a pile of pieces. But Ken put it all back together again and now it’s nice and sturdy. He also cut 4” off the bottom of each leg. In the meantime, Mr. Q ordered a basic metal bed frame from Amazon. Free shipping with Amazon Prime, and it was priced at less than $40. Next we measured the width of the bed frame and Ken cut a board to fit that width and I painted the board black. I debated stripping and refinishing the bed, which would have been lovely but a bit of a project with all of those details. Since I firmly believe that every room should have a pop of black I ultimately decided to paint it black instead. I painted it with Homestead House milk paint in Coal Black and I used their black wax as a finish. I like pairing the black wax with the black milk paint because it deepens up the black so nicely. By the way, in case you are wondering, the black wax has not rubbed off on our pillows at all and I waxed the bed about 4 days before we started using it. Once all of the details were in place, we brought the headboard, the metal frame and the black board up to our room. Ken thought it would best to assemble it in place. Assembly was super simple. Ken started by drilling holes in the board and bolting it to the metal frame. 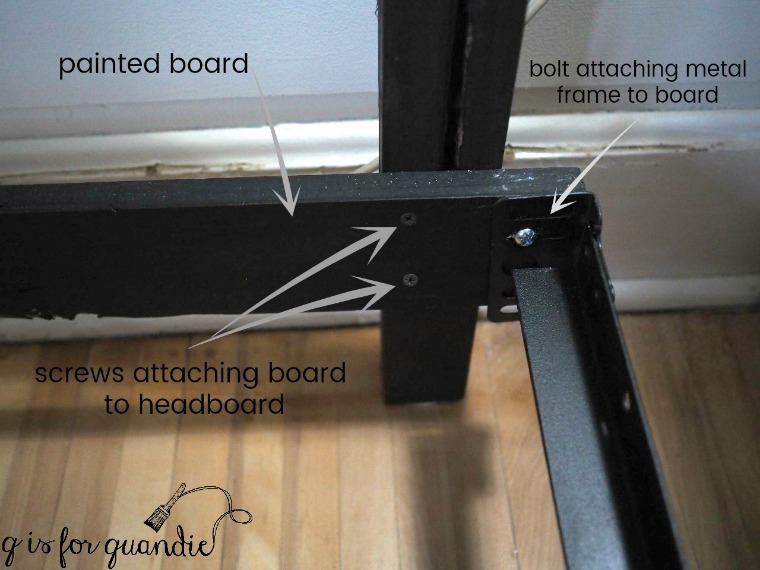 Then we simply snugged it up to the headboard and attached the headboard to the board with screws. Easy peasy. As you can see, the metal frame is just a couple of inches wider than the headboard. Once all of the bedding is in place, this difference won’t be noticeable at all. Honestly, this could not be any simpler. Anyone can accomplish this with a drill and some hardware. 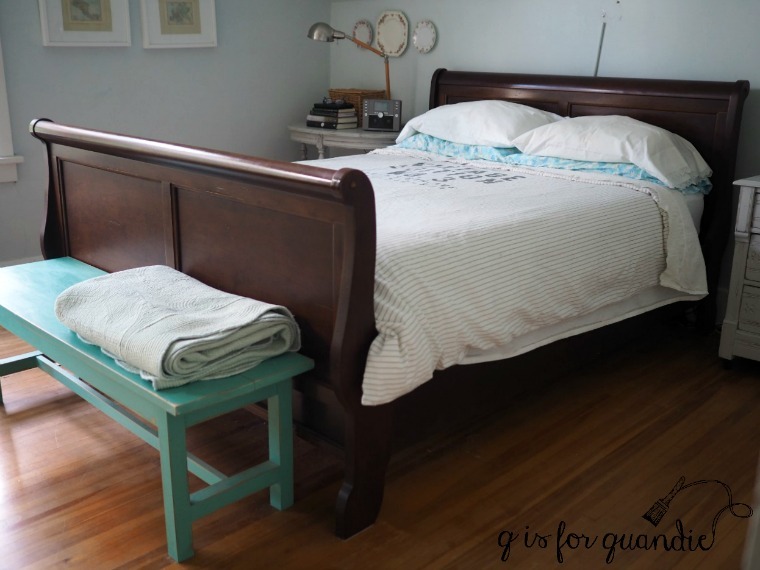 So if you’re thinking about a new look for your bedroom, check out your local Craigslist and find a gorgeous antique that you can modify (if you are in the Twin Cities and can have a taller bed than I can, check out this one and this one). Next came the bed skirt. Since I wasn’t able to use the side rails and foot board that came with the bed, it definitely needed to have a bed skirt. I looked at several online that I liked and the cheapest option was still $110. It was much more affordable to copy from Catherine on Home Talk (check out that link if you want specific details) and use painter’s drop cloths. 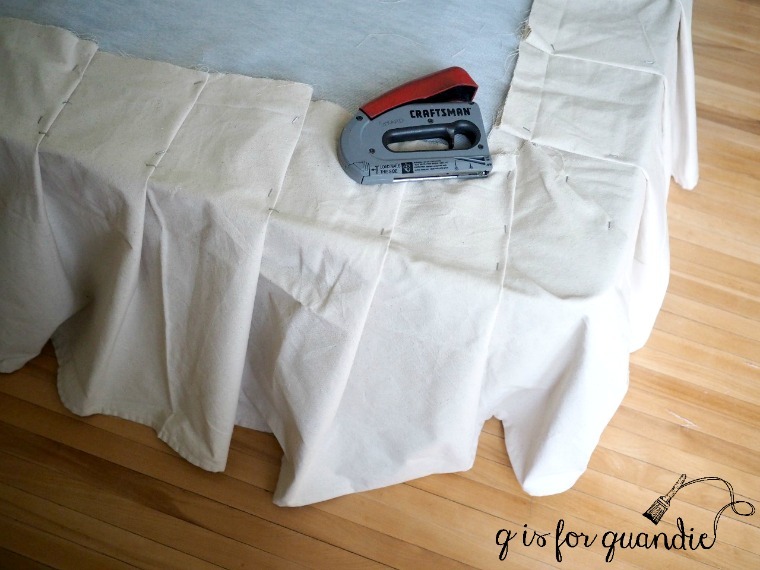 I was able to get by with one 4’ by 15’ drop cloth that I cut in half lengthwise giving me two pieces that were 2′ by 15′, and it cost less than $15. Catherine used upholstery tacks to attach the drop cloth, but I just used staples. Honestly, I’m not sure how well they are going to hold it in place over time, but I can always reattach it with tacks if it becomes a problem. Now comes the pricey part of the whole deal, the bedding. Have you ever noticed that it’s easy to spend more on bedding than you do for a bed? It adds up fast. In my case I felt like it really was time to update more than just the duvet cover, it was time for new pillows, a new featherbed and a new down alternative duvet, plus the duvet cover and pillow shams that are the only items visible. So I headed to my local Bed, Bath & Beyond to see what they had. This was the second highest expense of the entire makeover. I’d like to say that this post is sponsored by Bed, Bath & Beyond and they gave me all of this bedding for free, but no, I paid for it. In addition to the pillows, etc. I found a Kenneth Cole stone washed linen duvet cover and pair of shams in the discount bin. The color is called Mineral and is perfect with my wall color. 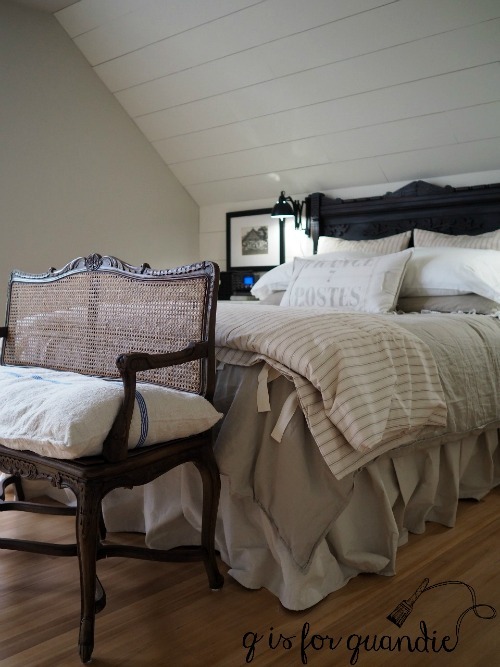 Since I wasn’t sure about all of the different shades of greige I had going on in the room plus the lack of any kind of pattern, I also ordered a ticking stripe duvet cover and pair of Euro shams from Ballard Designs in a color called Sandalwood. I didn’t really intend to keep both duvet covers. I thought I could try each and pick a favorite. Instead I discovered that the bed looks amazing with both of them. Dang! In addition, the Ballard duvet cover is really very heavy, perfect for winter, while the Kenneth Cole duvet is quite lightweight, perfect for summer. Can you tell that I’m working really hard to justify this expense? I didn’t need new sheets, I’m just using a set of white sheets that I already had. I’m also using a pair of vintage pillow cases with a tatted edge that I purchased at a garage sale. You’ll sometimes find vintage linens like these at garage sales and it’s obvious that the owner never used them. They probably were a wedding shower gift and were put in the cupboard back in 1959 and never taken back out. 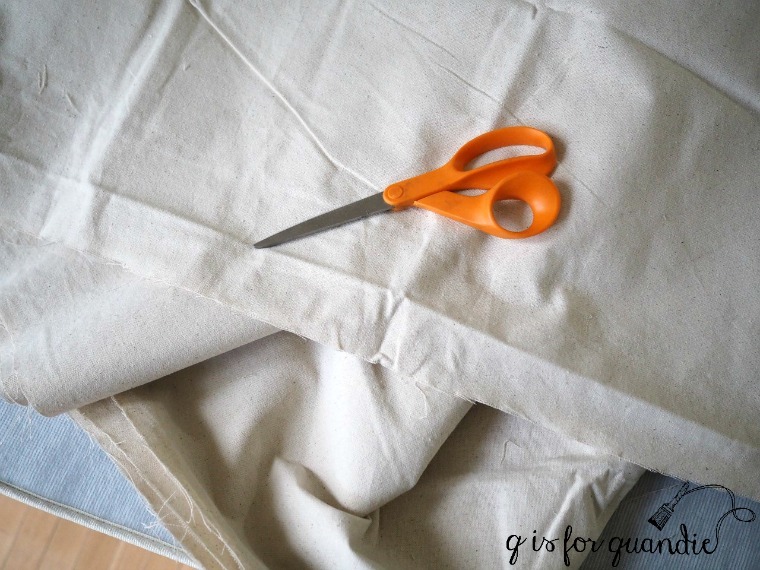 These vintage linens have the most amazing weight, so much better quality than most things you can buy new. 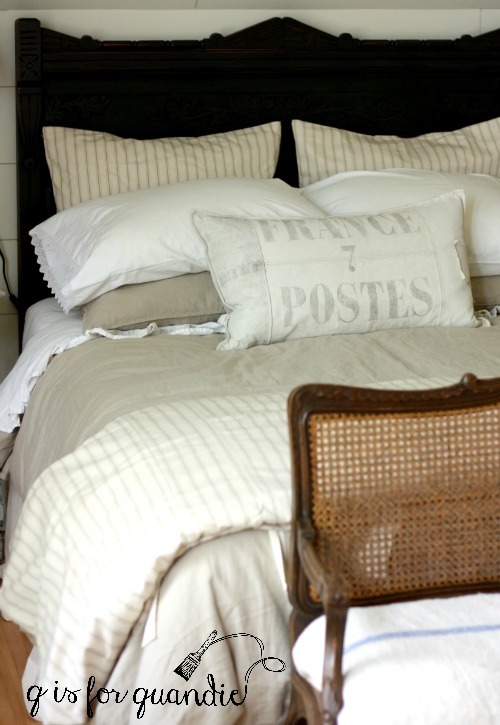 The France 7 Postes pillow is one I purchased many years ago, I’m pretty sure from Restoration Hardware. I have a pair of these and they get moved around all the time. The mate to this one is currently being used on the Belgian bench in my dining room. Overall, the bedding was a huge splurge for us and this is by far the most beautifully dressed bed we’ve ever had. I figure now that we’ve made it nearly to our mid-50’s it’s about time we had some grown up bedding, right? By the way, there is the cane bench at the foot of the bed. What do you think of my choice to leave it unpainted now that you’re seeing it in place? I’m loving how much more ‘presence’ the bed has now. The height of the headboard is perfect. It fills up the space all the way up to the angle in the wall. I also love the black up against the ship lap. I really could not be any happier with how the bed turned out. So, at this point I’ve shared my faux ship lap wall, my refinished floors, the refreshed cane back bench, my repainted nightstands, and now my bed. But there is still more to come for Mission Possible, I hope you’ll stay tuned! Sharing with Feathered Nest Friday on French Country Cottage. Previous the best day ever. I’ll have you over when the room is all done! Linda, the bed is gorgeous! I want Ken to be MY neighbor. The room is shaping up to be so beautiful. I love all the colors and that bedding is worth every penny. Looking forward to seeing more. Great job on the bedroom makeover! I love the black against the shiplap wall and your choice of bedding is timeless, so the splurge was worth it. 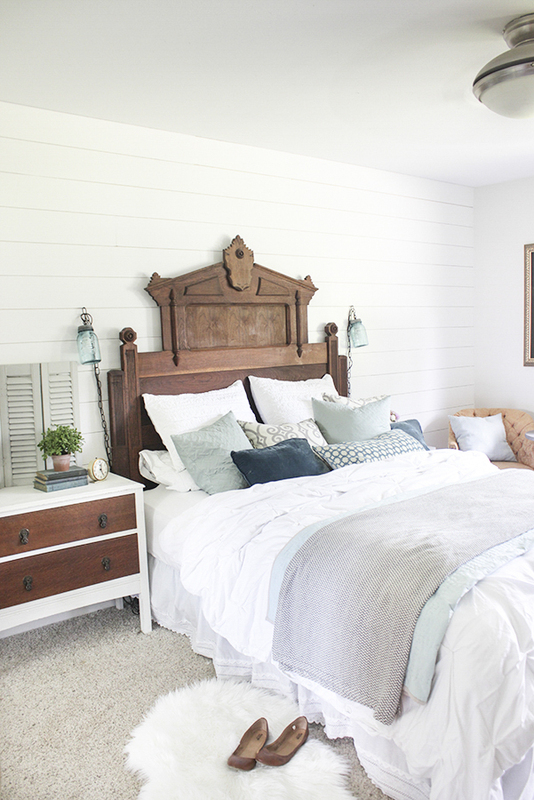 I think my favorite part is the way that black bed pops next to the shiplap wall! 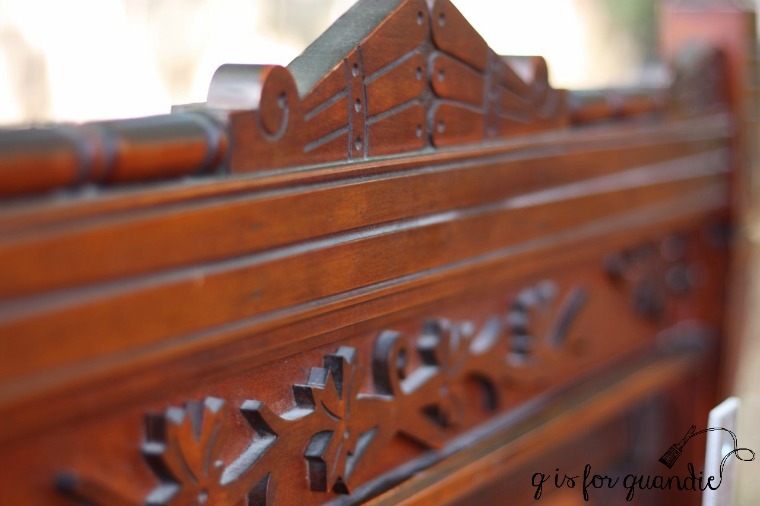 Your room is so lovely…I would paint the bench..just my humble opinion! Absolutely beautiful. You did a fabulous job. Thanks for the info on converting a double bed to a queen size. I never realized that it would be so easy. You nailed it again! Such talent. So. Easy. You don’t even really need any fancy tools or anything. Just a drill and some bolts & screws. Well Linda, just beautiful! I vote to leave the bench as is, but then again I am not as talented as you! Boy that Ken is just the bomb! I wish I had a great neighbor like him. I could keep him busy. (With woodworking) Lol! I am in the process of getting new things for our guest room. The linen coverlet I want will be expensive, but worth it. 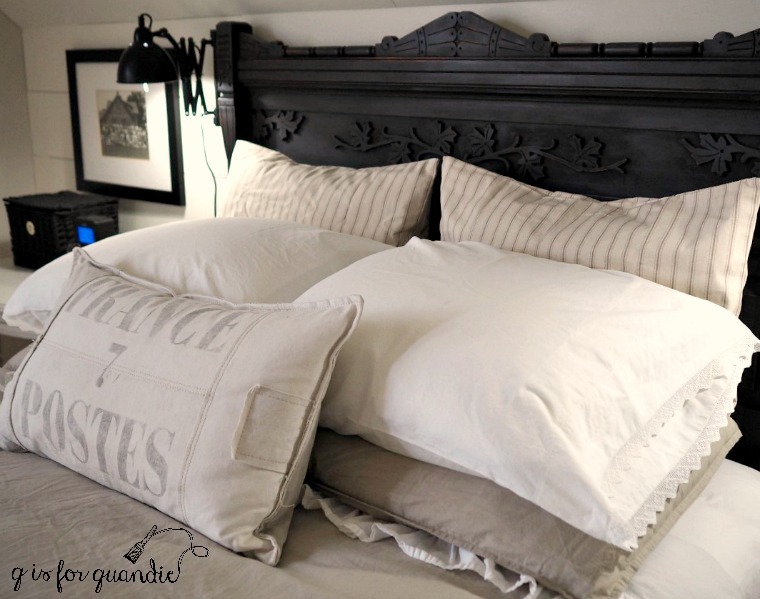 I love linen bedding and use sheets I have gotten from France on line. They are such good quality, they will withstand the test of time. Great job! 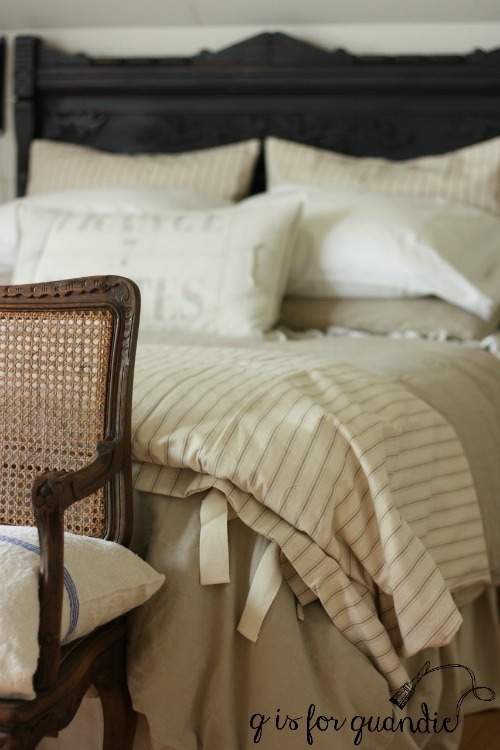 Linen bedding from France sounds amazing! I bet that is gorgeous! Love the headboard. Thank you for referencing the bed skirt tutorial. Just what I’ve been looking for! So far, so good with the bed skirt. I’m not sure how well it will stay in place over time, but really don’t have much to lose if it doesn’t work out. Your bedroom make over is beautiful. Can not wait to see what you do next. Hi Skip! Good to hear from you 😉 And thank you! I really love this colour scheme – It’s ALL fabulous! Great job! Thanks Carol! The ticking stripe duvet from Ballard also came in a version with black stripes and I contemplated ordering that one, but in the end decided the more subtle Sandalwood might work better. It’s always a bit of a gamble ordering these things online and not being sure if the colors will really work well together, but I got lucky this time! Hi Linda, I love your new room!!! Love the black bed. It really pops. Of course you know I love the.bench because it was mine😊 But I am wondering if it it too tall and taking away from your bed??? Maybe it looks more in proportion in person 😊Either way, it is all beautiful!! I’m just teasing you Lisa. I’m sure if it doesn’t work for me I can find another happy home for it! For now I’m hanging on to it though. It is turning out to be the perfect spot for the extra pillows at night! Amazing job. 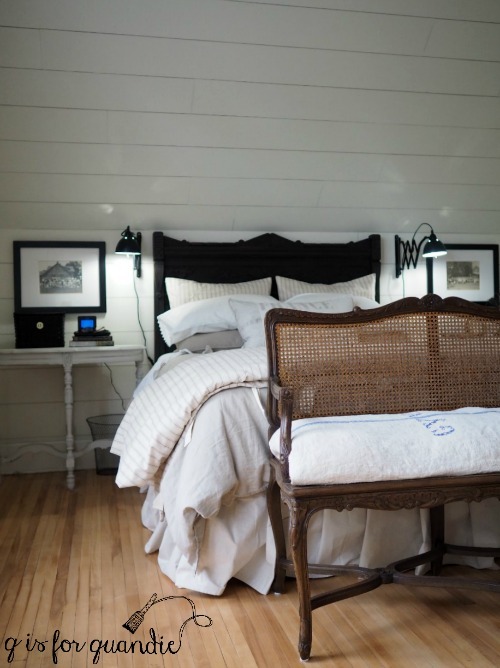 Two things….I think you should paint the piece at the end of the bed a bright color, or a metallic. I think it would really finish the space. Second, no need to spend a ton of money on comforters, quilts, bedding in general. Zulilly has a great selection of high quality bedding for totally reasonable ($30-$90) prices. At first I thought the quality wouldn’t be there but since then, I have bought 4 comforters (my husband likes options….don’t ask :)). I am very particular about the feel of comforters but these have all been amazing. I do suggest reading the comments before purchasing. But besides a few extra threads, I have had zero issues for over two years. And watch for the sales. They normally have deep discounts twice a month. Happy Shopping! And again, love the room. Thanks for that tip on Zulilly, I’ll have to check that out! Nice job Linda. I cannot decide if my favorite part is the vintage bed or the bedding. I absolutely love that headboard and love it even more painted black. I knew people somehow extended the wide of vintage beds but had no clue to achieve it. Thanks for sharing that nifty trick. And the tatted pillow cases are to die for. Will you be sleeping on them or are they are only “for show”? Cannot wait for the next part of this reveal. Thanks so much Victoria! I was hoping you would like it! As for the pillow cases, we’ll use them interchangeably with some other white pillow cases that we have. I try not to have things that are only ‘for show’ anymore, because they tend to just sit in a closet and never get used. Love the headboard and bedding but not sure about the bench at the foot of the bed. Only because it blocks the gorgeous bed and the colour of the wood is not repeated in the room so it seems to stand alone and be distracting. Great ideas though. Beautifully done. Oh Linda, your new bed is gorgeous, gorgeous and more gorgeous!!! I have done the same with my dust ruffle and it stays intact forever. I love your bench, but…in my opinion, I feel it blocks and takes away from the bed. Do you have a long, low bench? Your new bed so wonderful and inviting, it makes me want to run and jump right into it, but the bench might be in my way 😉 It looks like something professionally styled for a PB/ RH catalog! Great job!!!!! Good to know about the dust ruffle Patty! So far, so good with mine too. As for the bench, I think part of the problem is that I took all of my photos from down low and it may make the bench look just a tad more out of proportion than it really is. For now I’m hanging on to it, but who knows … I’m always switching things up at my house so down the road I may find something I like better. Revisiting some of your posts and when looking at this one I found myself wondering what you use to clean your refinished floors? Love the bedroom redo and how it all turned out!! Bwa ha ha … clean them? I’m supposed to clean them? When people ask me how I manage to juggle a full time day job, plus writing a blog, plus refurbishing furniture, I usually tell them I gave up house cleaning. Which is partially true. So far the only thing I’ve used on my refinished floors is a swiffer. If I spill something on the floor (or the cat upchucks a fur ball) I usually spot clean with a spray cleaner like Zep Hardwood & Laminate Floor Cleaner.